CyberPointers is going to have a year-long stitch-along challenge in 2012, called Menagerie. Over the year, Karen will give us the directions to stitch 2 “blocks” each month, which we can use however we want to – She also gives ideas for making them into ornaments or different kinds of samplers. 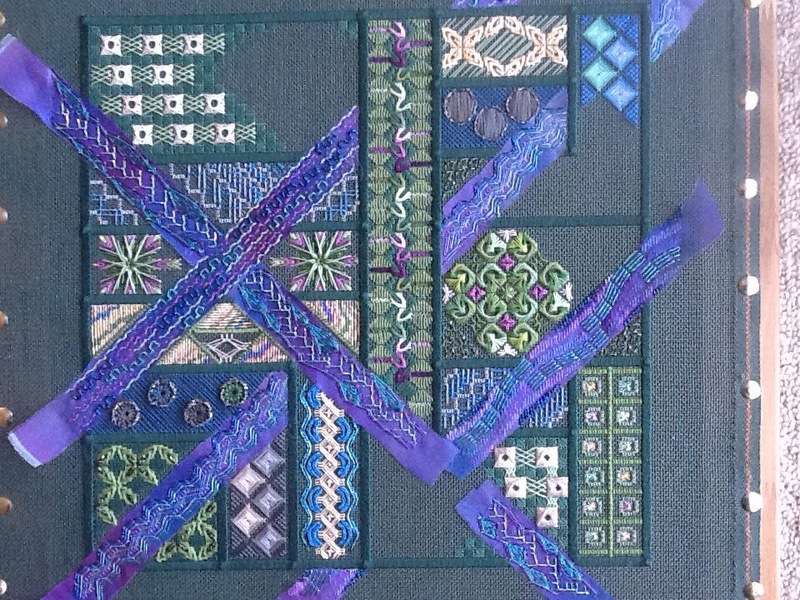 Thirteen of the blocks will focus on different stitching techniques, such as hardanger, bargello, blackwork, drawn thread etc, and the other 11 will be different needlepoint stitch types, such as diaper patterns, looped/linked stitches, box stitches and Hilton stitches. This sounds right up my street – I love creating things like this. But first, some decisions need to be made. 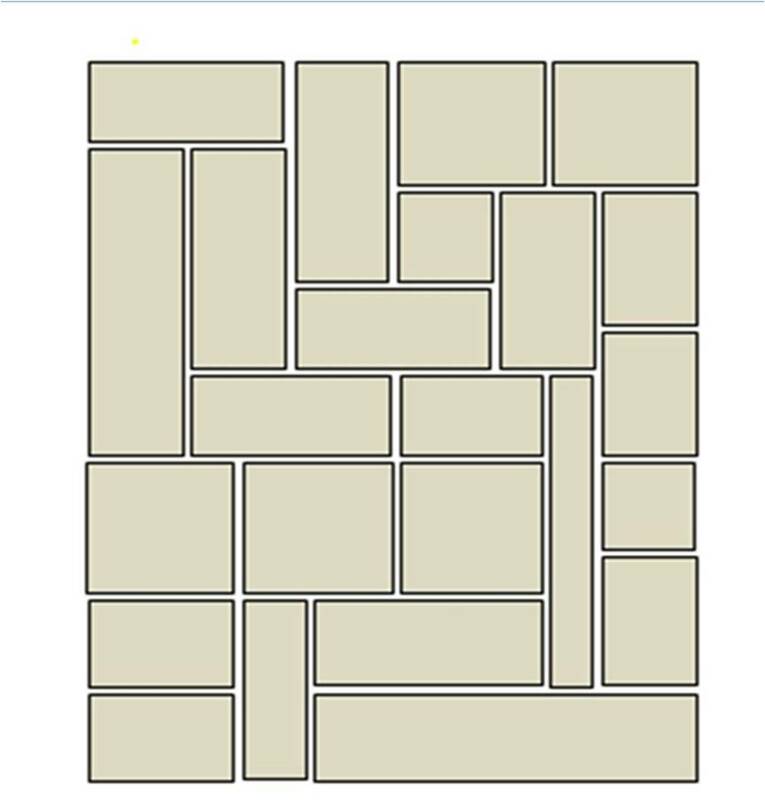 I want to do all 24 blocks, all squares or rectangles, and each with a border around it. Here’s my tentative layout. Karen’s instructions say the blocks will be based on squares 54 x 54 threads and she will give instructions about making them bigger or smaller. The diagrams of her intended layouts show different sizes, and even some triangles, so I reckon I will be able to get them to fit this layout. But should I stitch all the borders now? Then each month I would choose which shapes to use for those 2 blocks. Or do I wait so I can maybe alter some of the blocks at the time, to better suit the stitching insructions? But first I actually need to make some decisions about colours. I want to do the sampler in neutrals – ecrus, browns, greys, a bit of white, and some gold metallics. But what about the borders? Should I use a solid colour, and if so, which one? Dark or light? Or how about using a variegated thread? 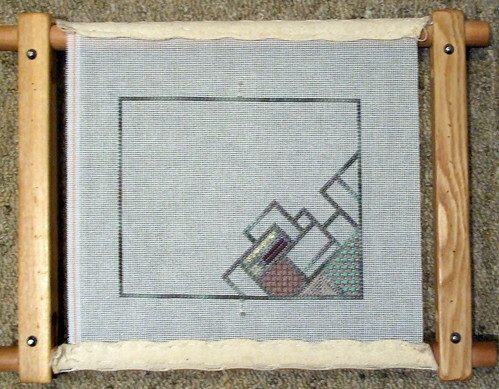 Here’s the lid of a box I made, and the borders are a fairly subtle variegated WaterColors thread from Caron. 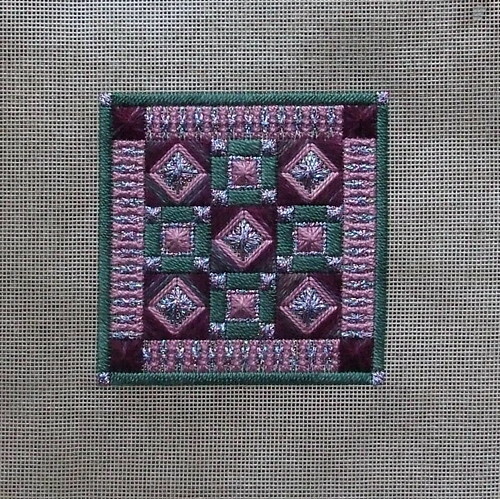 My sampler will a similar idea, but each section will be bigger, and will be rectangular or square and not have some of them going around corners, and the borders will be vertical and horizontal not diagonal, and probably satin stitch not smyrna crosses. 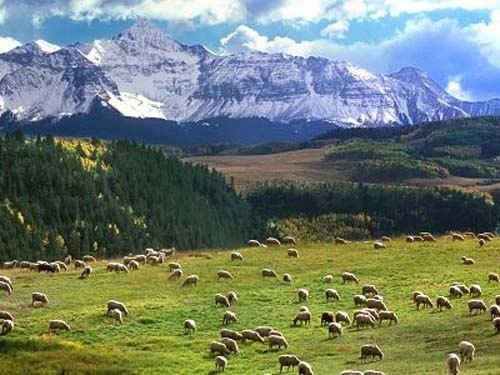 But otherwise it will be similar. So… solid colour or variegated? Decisions, decisions, decisions….. 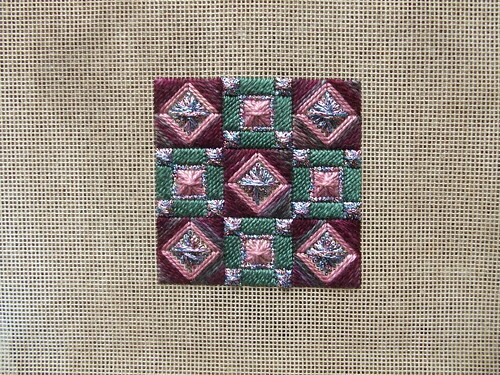 The mystery piece I was stitching from Laura Perin’s blog is finished. It is so glittery and shiny!! 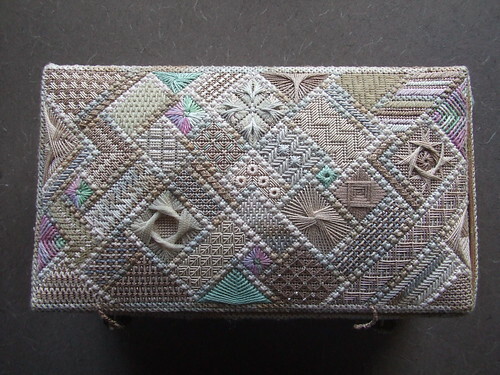 I have used this metallic thread before, but never in such quantity on one small piece – and if I had known how it would be used in this one I would have chosen a different thread. So I am really glad that I didn’t know in advance. That is the joy and fun of mysteries like this – they can “force” you do try something different. Sometimes I might not like the result, and sometimes (like this one) I do like it, but either way is valuable. Mysteries always teach me something – and being a ‘planner’, someone who likes to plan ahead, they let me see that there is value in just stitching and trusting the process. Here’s my version of Laura Perin’s Mini Mystery Monday, week two. Goodness me, but it’s shiny! The metallic thread I chose is so shiny and glittery; I’ve used it for accents before, but not in such a prominent way. At first I was thinking of unpicking it and finding something else to use, but I decided to leave it – to me that’s what mysteries like this are all about: experimenting, trying something different. So I’ve left it propped up where I can see it as I stitch other things each evening in front of the televsion; and now I love it! I’m looking forward to the next installment. All the diamonds are one – so where will the variegated thread and the metallic blending filament be used in December? A border? Filling the triangles that formed? Hmmmmm…. I changed the position of most of the diamonds, from what the instructions suggested because I wanted the 6 that cover most of the canvas to be on the outside, and the four more open diamonds on the inside. I love the outer ones, but I think those 4 inner ones look a bit busy. 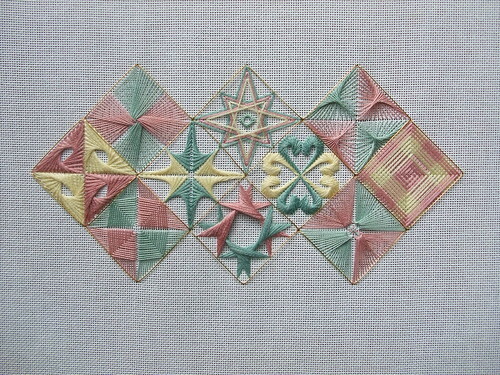 I changed some threads too – the 8-point star was supposed to be done in one strand of perle cotton, but my perle colours were too faint, it looked insipid. So I re-did it using 2 strands of floss. Much better. I changed at least one other diamond’s threads as well. Oh, and the walnetto in the bottom diamond – I did that twice too, because I did it in green and yellow first, and that really did look too messy. The green and terracotta looks a more defined. I’ve hummed and hah’ed over whether to swap the 3 open inner diamonds. The way it worked out, was that the 2 with colours on opposite sides ended up in the centre. Would it be better to have the two spiky ones in the middle and the rounded one in the centre bottom? Or perhaps the two that have ‘cut-out’ bits in them should be the centre 2, with the solid star at the bottom? In the end I decided to leave it as is. It will be interesting to see what December has us do to finish it all off. Part 1 of a mystery project that Laura J Perin is posting on her blog. She has given us the suggested threads, and an idea of how to choose the colours. I am using a much darker variegated thread, so it will be interesting to see how it turns out! Being a mystery, we have do not know what the finished project looks like yet; Laura is going to post an installment every Monday for a few weeks. The other mystery is why I haven’t posted for so long – I have no idea. I just stopped blogging. I thought I was too busy to post, that I would do it later. And suddenly weeks have gone by, the project I was going to document as I stitched is well and truly finished and in use. So I will try again. There is no way I can post every day as so many people do, but I will try to post at least weekly. The colour scheme is developing nicely – two shades of brown, purple and green, and the outlines are a Watercolors thread called Pebbles. However I am not sure about that dark purple because it stands out a bit much I think. I am aiming for more of a harmonious blend rather than having something glaring like that. 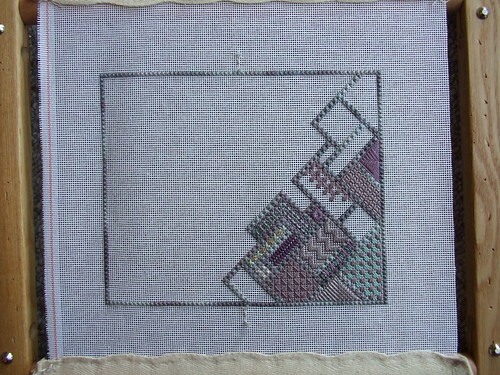 But I will leave it for now and decide about it after more has been stitched. When I start or finish a thread, I make sure any weaving of tails is done only in the outlines or the space currently being filled. I don’t weave any thread into a neighbouring space; that way it is very easy to unpick anything I don’t like. I am also wondering about adding beads to some areas – for example the green and brown at the lower right corner, or the dark brown part further long the bottom. Maybe, maybe not. I will wait till it’s all finished to decide. I love the dark brown patch on the bottom edge. It’s just a simple, basic checkerboard but with one stitch going across each square at right angles. Very simple but it gives a wonderful texture. This sort of stitching lets you use all your favourite stitches LOL. 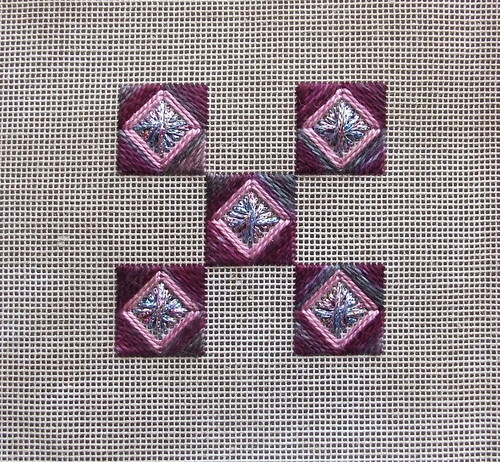 Another one that I love doing is the woven effect just above the dark purple. One of the threads I used in that is a dark metallic and I am really pleased with the lift that it gives. You can see a close up of the stitching by clicking on the photo, which will take you to Flickr, then right click and select “large” or “original” size. This book has to be re-covered! 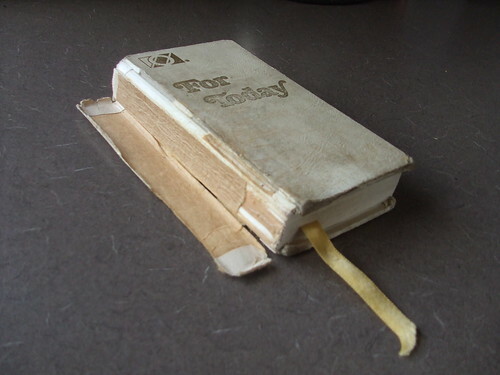 I have a little book with daily readings – it is well-read, and BADLY in need of a decent cover to stop it completely falling apart. I will do it the style that Jean Hilton made popular with her piece called Puzzle, and then her Puzzle Purse. I found I really enjoy this sort of stitching when I did the Puzzle Purse and I also used this style when I made my needlepoint box. I’ve outlined the area to be stitched with crosses, and then stitched some diagonal lines in smyrnas, creating simple shapes. I have no idea yet, which stitches I will use to fill in those shapes – I will just decide when I get to each one. 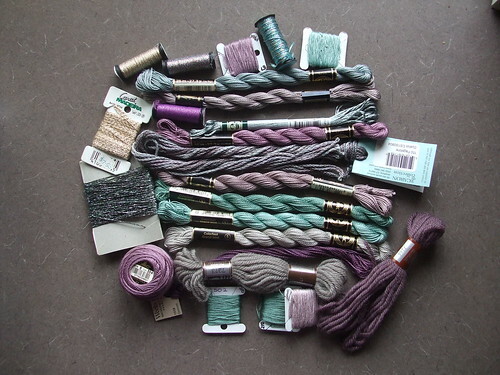 My threads… Mostly DMC threads – perle 5 & 8,, and floss. There are also some fabulous metallics that Jan from StitchLady very kindly sent to me. I’m sorry it’s such an out-of-focus shot so that you cannot see the stitches well. I will try to do better as I stitch more. I would try to describe them, but I’m not very hot on stitch names… I tend to just stitch them without bothering about what they are called. So that’s the start of my new book cover. As I progress, I will try to explain my thinking, and why I choose particular stitches. I love reading things like that on other people’s blogs so I shall try to do it too. Taking a short break from needlepoint, so I’ve put down the tapestry needles and picked up the knitting needles. I’ve always enjoyed knitting, and while browsing around Ravelry recently I came across Jane Thornley’s patterns. Colour! Texture! Love! So this is my first attempt at Jane’s style. I’ve been feeling the cold a bit this winter, so what better than a fun shawl/stole/very-wide-scarf to throw around my shoulders? It’s about 75cm (30 inches) wide and I guess its length will depend on how much suitable yarn I can find in my stash. 🙂 I don’t think the photo really shows off the different textures of yarn – I will try to get a better shot to highlight them when I’ve done a bit more. Lots of fun, with free reign to ceativity. I am fighting the urge to come up with formulae, and generate a rotation list for the yarns and stitches. I don’t think that’s what Jane’s style is all about, but it is the way I usually tend to work. But not on THIS project! I had been planning to take progress pictures, and blog about how I decided which colours and threads to use in each section, but somehow I just kept stitching. It was really a fun piece to stitch, with so many interesting techniques. It also uses different threads, some of which are difficult to find around here. However I had some ecru Neon Rays so I had to find a variegated thread that would go with the ecru, then chose the soldic colours from there. 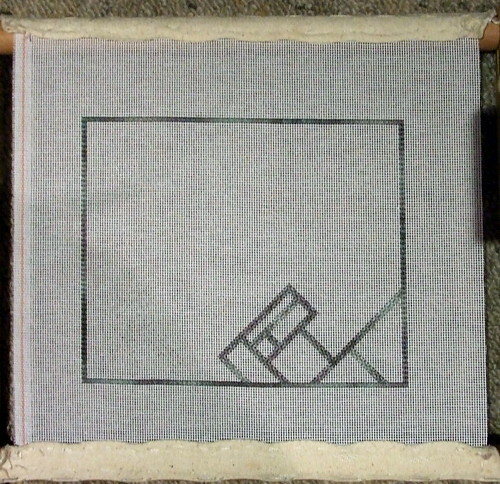 One fairly major deviation I did from the pattern was in the very top and bottom squares. 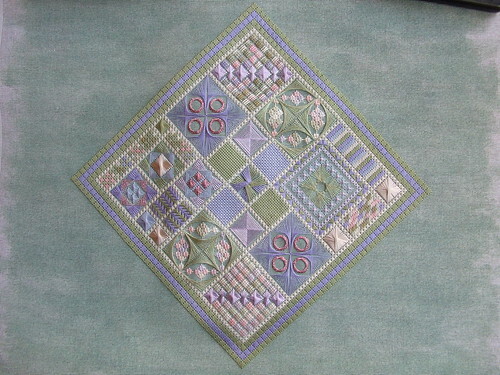 The pattern called for one of them to be in a variegated thread with the Rhodes stitches across the square done in rayon. Then use the same threads but in reverse for the other sqaure. 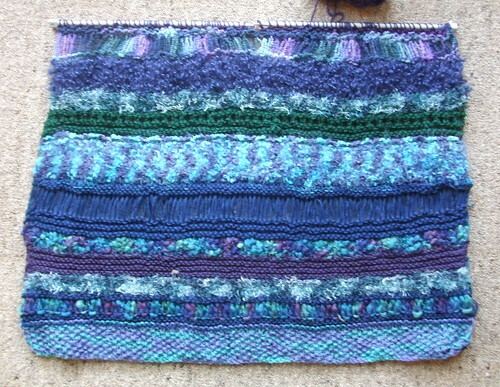 I didn’t like the expanse of rayon, so used another variegated, in darker tones of the same colours. I haven’t cropped the photo, so you can see how it was just plain old white canvas which I coloured myself. I use ordinary acrylic artist’s paints and a fairly thick dry brush. Don’t load the brush too heavily with paint or it globs up and blocks the holes. I just brush all over, without worrying about getting it even; I think a bit of mottling or uneven coverage adds to the hand-crafted look. As usual, you can click on the picture to go to Flickr and then right click to see it up close.